So, I have to start this post by saying that when Olivia Rivers contacted me to do this reveal, I screamed in the middle of class and fangirled so hard that my professor asked if I was okay. Alright, so before I get into the fun stuff, here is some basic info about Tone Deaf (Which I am growing more and more excited to read the more I write for this post). For child prodigy Ali Collins, music was life. All that changes when a brain tumor lands her in a silent nightmare, controlled by her physically abusive father and the deafness she’ll never get used to. When Ali accidentally wins a backstage tour with the chart-topping band Tone Deaf, she reluctantly accepts the prize, only to be kicked out. Jace Beckett, the lead singer of the pop-punk band, refuses to even speak to Ali because she is deaf. Ali threatens to report Jace’s discrimination, but ends up agreeing to keep quiet in exchange for money. With a bit of cash, she can escape to New York and get away from her father. Then Jace notices her fresh bruises and changes the offer, claiming he’ll use his influence and connections to help Ali escape. But even when Jace reveals a baffling fluency in American Sign Language, she can’t bring herself to trust him. When Ali’s dad crosses a new line, she’s driven to accept Jace’s offer despite her fears. Soon she’s traveling cross-country, hidden away in Jace’s RV as the band finishes their nation-wide tour. As weeks pass, the members of Tone Deaf start to resemble a quirky little family. Then there’s Jace. Ali can’t figure out his mood swings, but she knows she’s falling for the passionate and secretive musician. Jace’s hardened attitude melts away more with every mile they travel, and Ali finds herself ever closer to understanding his attitude towards the deaf. But when tragedy strikes, Ali must decide between walking away from Tone Deaf, or sacrificing her freedom to save Jace and his band. Doesn’t this sound amazing!?! Okay, I have to admit – part of my excitement stems from the fact that the love interest’s name is Jace. Plus, the entire idea is awesome XD. Deaf girl and musician romance? I’d be lying if I said I wasn’t intrigued by the idea of a deaf main character, I can’t wait to see how the narrative is written! “Tone Deaf” was inspired by a lot of little ideas slowly mushing together. For one, I wanted to see more disabled characters represented in YA books, so writing a medically deaf character really appealed to me. But I was also interested in doing a story about music, since the world of bands is so unique and crazy. Then one day, I was jokingly brainstorming terrible band names with a friend, and “Tone Deaf” was one I came up with. It led to a light-bulb moment—what if I combined a music story with the story of a girl who loses her hearing? 2. What made you decide to write from a deaf narrator’s point of view? Is this connected to your title, Tone Deaf? The idea for “Tone Deaf” just sort of sprang up, and as soon as I realized it would require a deaf narrator, I was really excited about the prospect. As for the title, it’s the name of the band in the book, and the reason for that name plays a part in the plot! 3. Did you do any research on being deaf and Sign Language before writing your book? 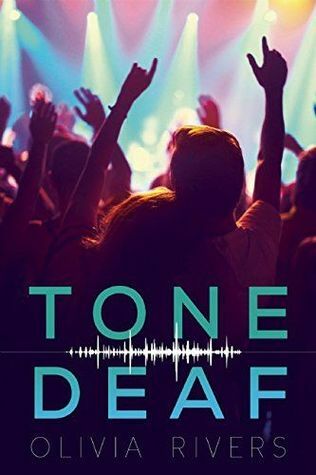 Yes, there was actually a bunch of research that went into “Tone Deaf.” Researching medical deafness, Deaf culture, and American Sign Language was actually one of the best parts of writing this book—they’re such fascinating topics to learn about! Since my main character loses her hearing to a medical issue, a lot of my research was done by reading medical articles and books. But I also got some amazing help from Deaf readers I connected with online, and I had a professor from Gallaudet University (which is the nation’s leading college for the Deaf) also offer some great feedback. 4. What is your favorite book? Did it inspire you in any way to become an author? Oh, this is such a tough question! “Redwall” by Brian Jacques is a book that I both love and find hugely inspiring. It’s an adorable Middle Grade Fantasy, and it made me fall in love with reading as a kid. 5. Who is your role model when it comes to writing? I have so many authors I consider role models, but Ellen Hopkins is one of my favorites. Not only is her writing drop-dead gorgeous, but she’s also such a humble woman who works so hard to help at-risk teens. 6. What advice would you have for aspiring authors? Write! It sounds overly simplistic, but finding the motivation to sit down and write is the biggest obstacle for most authors. Everything else in life will try so, so hard to distract you from your writing, but you’ve just got to buckle down and get it done. Now, without further ado, here it is – the amazing cover of Tone Deaf. Sounds so good, I can’t wait to read it!